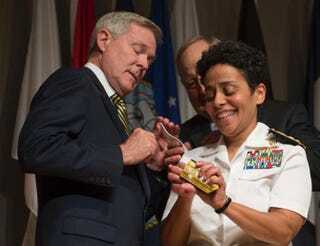 U.S. Navy Adm. Michelle Howard lends a hand to Secretary of the Navy Ray Mabus as he and Wayne Cowles, Howard’s husband, put four-star shoulder boards on Howard’s service white uniform during her promotion ceremony July 1, 2014, in Arlington, Va.
"Michelle Howard's promotion to the rank of admiral is the result of a brilliant naval career, one I fully expect to continue when she assumes her new role as vice chief of naval operations, but also it is an historic first, an event to be celebrated as she becomes the first female to achieve this position," Secretary of the Navy Ray Mabus, who presided over the ceremony and administered the oath of office, said, according to the release. "Her accomplishment is a direct example of a Navy that now, more than ever, reflects the nation it serves—a nation where success is not born of race, gender or religion but of skill and ability." "Michelle's many trailblazing accomplishments in her 32 years of naval service are evidence of both her fortitude and commitment to excellence and integrity," Adm. Jonathan Greenert, chief of naval operations, added. "I look forward to many great things to come from the Navy's newest four-star admiral!" Howard graduated from the U.S. Naval Academy in 1982 and from the Army’s Command and General Staff College in 1998. She has a master's degree in military arts and sciences. In addition to being the first female four-star admiral, she is also the first African-American woman to command a ship in the U.S. Navy, the release notes. President Obama’s senior adviser, Valerie Jarrett, tweeted out her congratulations to the inspiring admiral, who was awarded the 2011 USO Military Woman of the Year and the 2013 NAACP Chairman’s Image Award.